Author(s): Shin-ichi Kawamoto, Tatsuo Yotsukura, Ken Anjyo, Satoshi Nakamura. Article: Computer Animation and Virtual Worlds, Vol. 19, No. 3-4, pp. 247--257, 2009. 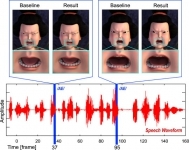 We propose a set of algorithms to efficiently make speech animation for 3D cartoon characters. Our prototype system is based on blendshapes, a linear interpolation technique, which is widely used in facial animation practice. In our system, a few base target shapes of the character, prerecorded voice, and its transcription are required as input. We describe a simple technique that amplifies the target shapes from few inputs using a generic database of viseme mouth shapes. We also introduce additional lip-synch editing parameters that allow designers to quickly tune the lip movements. Based on these, we implement our prototype system as a Maya plug-in. The demonstration movies created with this system illustrate well the practicality of our approach.